I don't know if you are familiar with the Croatian tradition, I'll try to write everything I know about it. Dishes like fritule, kroštule and donuts are in Istria, Kvarner and Dalmatia very famous. On the events like carnival, traditional weddings and similar events you will find these dishes on the table. I personally adore these dishes they are like a snack. There is no way that is possible to pass by and not to try one of these dishes on the time of carnival. 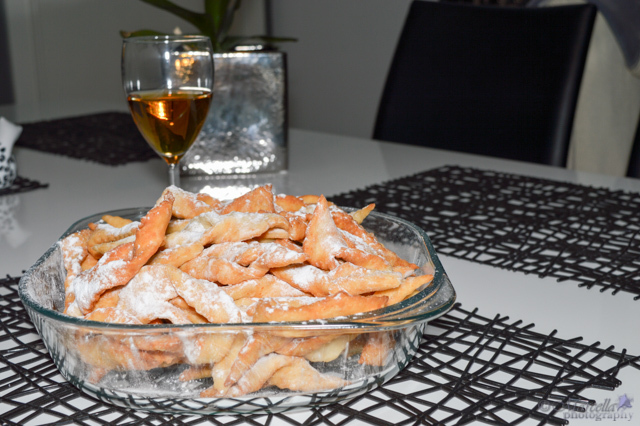 Carnival is time from 06th of January until the beginning of Lent. Every weekend is a fest under the mask and people enjoy together in celebration. If you are wondering why are you celebrating this, by the old Slavic traditions they believed this is a right way to forcing all the evil that happened in the previous year, and that everything is better in the new year. Last weekend is known were a lot of different groups go on International Rijeka Carnival. The whole city center is blocked and reserved for the carnival all day long. Even the recipe looks very easy and simple, you must be very careful on the temperature of the oil and the density of the mixture. In case, you don't like powdered sugar you can put on the Korštule melted chocolate as well. A dough of the following ingredients, wrap in plastic wrap and leave about 30 min at room temperature. The dough needs to be like that for homemade noodles, then roll out and cut shapes as desired (strips, cubes). Put in oven heated oil only briefly on both sides and remove to paper towels.